The first Gloucestershire Old Spots pigs in Alaska. These very rare (critically endangered) pigs are just starting to make a comeback. We shipped breeding stock up from Oregon, from Luther & Julie Clevenger's White Buffalo Ranch. 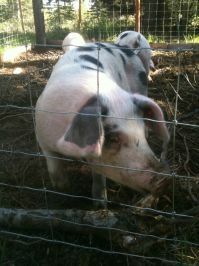 The GOS pig originated in England as an orchard pig that peasants could keep due to their good foraging habits. They are better suited to our climate due to their English past. These very social pigs are built like pigs used to be. Ours enjoy living with outdoor pasture and spruce forests to spend their days in. These pigs remain much as they were many years ago. They have not been manipulated by large corporations to live in confined spaces or put pounds on as fast as possible. 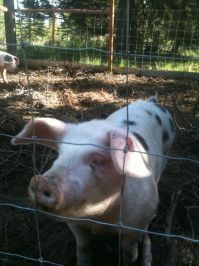 These pigs retain their instincts and are well-rounded; meaning, they are good mothers, good foragers, grow well, and have a very friendly demeaner. GOS meat is highly regarded due to superior flavor & marbling. It is so highly regarded that it was recently given Traditional Specialty Guarantee status by the EU. This is the first meat of any animal ever awarded such status and is designed to ensure that these pigs continue to rise in numbers, but not by being raised in large, confined, intensive operations. They have to be raised by small farms, like ours, to be qualified for this status.